You can duplicate any design. This helps to quickly start a new design or to archive a design. A duplicated design includes all content, but does not include Review topics and comments. 3. Select the design to be duplicated. 5. Edit the design properties. Open the design properties dialog by selecting Get Info from the File menu or from the right-click context menu, or by using the keyboard shortcut. 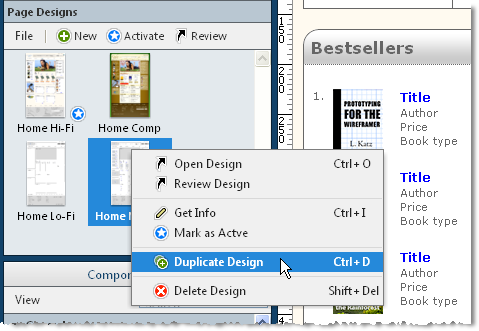 As shown below, you can duplicate a design using the right-click context menu.